Yitzhak Rabin (1922-1995) was one of Israel's leading military figures and political leaders. He was the seventh IDF chief of staff and was later elected prime minister twice, in 1974 and in 1992. As prime minister, he led Israel during the period of the Oslo Accords, which attempted to set the groundwork for a peace agreement with the Palestinians. On November 4, 1995, right-wing extremist Yigal Amir shot and killed Rabin following a peace rally in Tel Aviv. Rabin was born in Jerusalem, when the British controlled Palestine, and grew up in Tel Aviv. He attended the Kaduri Agricultural High School and hoped to become an irrigation engineer. In 1940 he graduated with honors and in 1941, he joined the Haganah, and quickly rose to the senior ranks. In 1948 he married Leah Schlossberg, his sweetheart of five years. 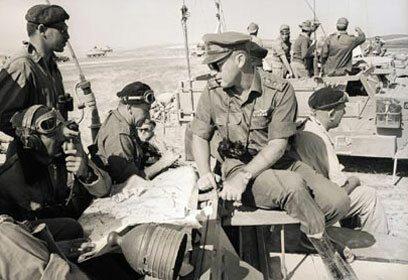 Rabin had an illustrious military career: During the 1948 War of Independence, he directed the defense of Jerusalem and headed battles against the Egyptian army in the Negev. In 1950 he was named chief of military operations and in 1953 rose to the rank of brigadier-general. In 1956 he was named Northern Command Chief and in 1959 made head of the IDF's Operations Branch. In 1964 he was appointed IDF Chief of Staff. It was under Rabin's command that the IDF defeated Egypt, Syria and Jordan in the 1967 Six Day War. In 1968 Rabin left the IDF and was appointed Israel's ambassador to the US. His tenure ended in 1973 and he returned to Israel. Later that year he was elected to the Knesset for the first time, as a member of the Labor Party. In the aftermath of the Yom Kippur War and the subsequent resignation of them-Prime Minister Golda Meir in 1974, Rabin was elected Labor Party Chairman - beating Shimon Peres – and became prime minister. In June 1974, Rabin's Labor won the general elections, making him the first prime minister to be born in Israel. During his premiership he ordered the Israeli commandos to carry out the famed Operation Entebbe (July 1976) – the rescue mission of a plane hijacked by Palestinian terrorists that was being held in Uganda. The end of 1976 saw a political crisis brew, as Rabin's coalition broke down. Rabin resigned, bringing forth a transitional government, which he led. In 1977 he was elected Labor chief again, and named the party's nominee for prime minister. In mid-1977 Rabin resigned from office after it was reported that his wife, Leah, had maintained a bank account in the US. At the time, Israeli law made it a misdemeanor for state officials to have foreign bank account. Peres was elected Labor chief in his place. Between 1977 and 1984 Rabin served as MK and member of the Knesset's Foreign Affairs and Defense Committee. When the first unity government was formed in 1984, he wad named defense minister. When the second unity government was formed in 1988, he retained office. His tenure as defense minister ended in 1990. In 1992, Rabin led Labor to another election win and was named prime minister for the second time. In 1993, after a clandestine negotiation with the PLO (Palestine Liberation Organization) Rabin and then-PLO leader Yasser Arafat, signed the Oslo Accords, which created the Palestinian Authority and granted it partial control in areas of the Gaza Strip and West Bank. 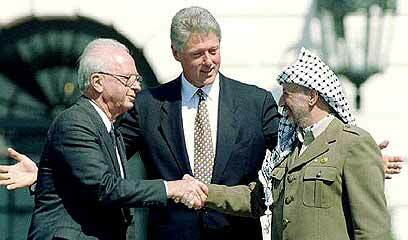 In 1994 Rabin signed a peace agreement with Jordan. Later that year he was awarded the Noble Peace Prize, along with Shimon Peres and Yasser Arafat. Rabin and Peres' – who he named foreign minister – tireless efforts to achieve peace in the Middle East boosted Israel's stand in the world, resulting in the official lift of the pan-Arab ban on Israel and in an unprecedented rate of foreign investments in the economy. Israel's pursuit of peace with the Palestinians brought about renewed diplomatic relation between Jerusalem and dozens of countries around the world. Contrary to the success he met in the international arena, Rabin faced raging opposition to the Israeli-Palestinian peace process from his political rivals and many in the Israeli public. As PM, he also had to deal with dozens of bloody, gut-wrenching terror attack which tore through Israel. The public atmosphere seemed more and more heated and Rabin began getting death threats. The threats became more and more frequent as time went by, and some of his last public appearances turned into violent riots. On Saturday night, November 4, 1995, Rabin attended a peace rally in Tel Aviv's Kings of Israel Square. "Violence," he told those attending, "Is the very thing eroding Israeli democracy." Moments later, as he was walking back to his car, he was assassinated, gunned down by Yigal Amir.